In 2016, Trump’s vocal hatred for immigrants, women, and anyone who didn’t agree with him found its way into the homes of every American family. By T.V., car radio, and of course, social media, it felt as if no outlet was safe from Trump’s venomous words. The overpowering exposure of hate unfortunately left many vulnerable viewers looking up to a less than ideal role model. Following the election, school teachers were amongst the first to notice an increase in name-calling and bullying by a majority of the student population. 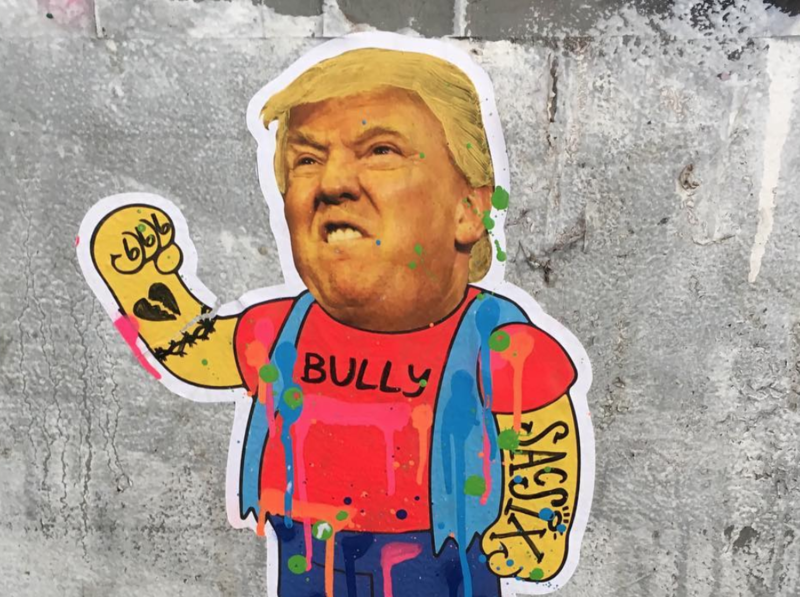 Enticed by these allegations, Francis Huang from the University of Missouri, and Dewey Cornell of the University of Virginia, set out to explore the relationship between bullying rates and the 2016 election. The research project consisted of administering school climate surveys taken by over 150,000 students across Virginia before and after the election. To no surprise, the pair of researchers found higher rates of bullying and teasing in 2017, compared to lower rates in 2015. In particular, seventh and eighth graders attending school in Trump-supporting areas reported bullying rates 18 percent higher than students living in pro-Clinton locals. While these result are in no way drawing a definitive causal relationship between Trump’s election and increased bullying, they are shedding light on the effects of having a bully for president, AKA the Trump Effect. The Trump Effect (noun): an increase in bullying in schools caused by the rhetoric Donald Trump used in his presidential campaign. This term became an effective way to explain how Trump’s hate speech and bullying antics reflected in our social world. Some argue that the Trump Effect is simply a hoax created by the far-left, and that bullying, as a matter of fact, did not increase. The critics argue that it’s our attention to bullying that became more heightened. However, try telling that to the 70 percent of kids who believe that it would help children their age be kinder if those in charge of the country set a better example. Trump’s harassment and hate is certainly sending out a message: bullying is okay because the president does it. While politicians may beat their chests, and howl at each other night and day over deals and bills and ill-conceived walls, they are forgetting the little ones who are watching them, looking up to them. At an early age, we are conditioned to look up to authoritative figures, be it our parents, teachers, principals, and presidents. By nature, we are even inclined to model their behavior. As a child today, those pickings for a role model are less than ideal. What I believe to be a role of value and honor – the president’s role – is currently occupied by a bully. How can our kids, who are surrounded by adults who support a leader that relentlessly indulges in aggressive and manipulative bullying, find a proper role model in our government? What message are we sending our children when all they see on our T.V. screens are adults fighting like children? Our president just recently threw a temper tantrum over not getting his wall – a clear monument to the brutish stupidity of racism – all the while remaining indifferent to the suffering of a multitude of government workers who faced eviction and poverty as a direct result. How can we explain this behavior coming from one of, if not the most, prestigious office in the country? Herein lies the complexity of this issue: parents, teachers, and kids themselves must reclaim notions of civility and respect. Citizens now must remind the president how he is supposed to behave. While this burden is not one many of us expected to carry, it is one we must address if we wish to limit bullying and encourage respect. Together, we will say no the Trump Effect, because we get to choose what affects us!